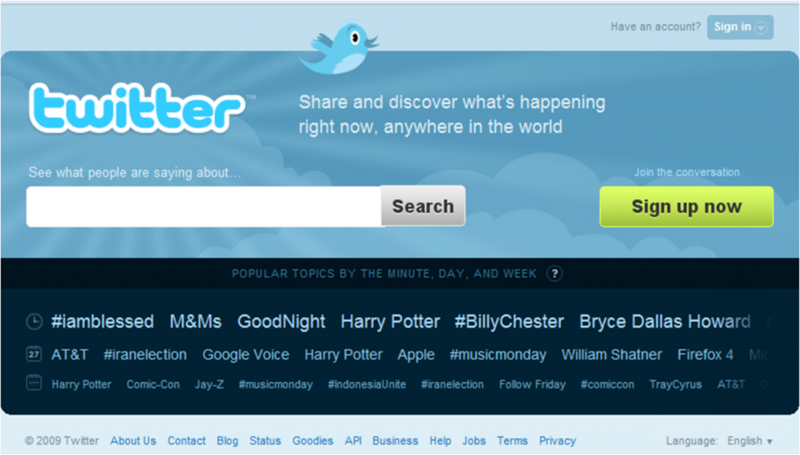 The new home page of Twitter say it all. Real-time search is coming and permits to “share and discover what’s happening right now, anywhere in the world”. Twitter has defined itself the Pulse of the world and has ambitious targets, 1 Billion users by 2013 with a user being defined as a “unique individual having a conscious twitter experience in a given week.” The leaked Twitter documents published partly on TechCrunch gives a nice overview on the strategy and plans for Twitter. Many people said there was no business and no business model, well it is coming and it seems a very strong value proposition. Mobile Apps: native or browser based? At the moment we have two visions, apparently conflicting, on future of mobile applications. Will mobile applications be written in the native language of the platform, or they will be platform-independent and browser-based? The discussion is still open and there is no clear answer. Google, Apple: Two Mobile Software Visions is the title of a BusinessWeek article. TechCrunh reports “Google Says Mobile Web Apps Will Win In The Long Haul“, via the FT article App stores are not the future, says Google. The two visions are not complementary when the Web becomes the platform as in Google Chrome OS. What it is certain is that at the moment the App store is very popular and all the players in the mobile domain are or are going to have one. But for the future, I tend to agree with the Google’s view and I believe that that browser-based apps will have the largest share of the market. With this move Google is clearly entering in the Microsoft space. But in the digital convergence world, the boundaries are fuzzy and there is no “safe space” where to play. The concept of Plaform Envelopment is relevant here. Interesting to see that like Android, the Chrome OS is released with its source code, a very different approach from Windows closed source policy. This reflects a different philosophy and their very different business models. The news in TechCrunch Google Drops A Nuclear Bomb On Microsoft. And It’s Made of Chrome, Google Chrome: Redefining The Operating System and in the NYT Google Plans a PC Operating System. The latest book of Chris Anderson is just out and it has already created interesting discusssions on the argument. Free: The Future of a Radical Price: The Economics of Abundance and Why Zero Pricing Is Changing the Face of Business . The first news was about the use of quotes from Wikipedia not expressely cited by the author. Chris answered in his blog with the post Corrections in the digital editions of Free. And then, the quite critic review from Malcolm Gladwell in The New Yorker “Priced to sell“. And Chris’s answer Dear Malcolm: Why so threatened?. The Times magazine gives points to Malcolm in the debate between the two. But Seth Godin presents his opionion in the post Malcolm is wrong. John Gapper of Financial Times, reviewed and discusses Free in his blog with Chris Anderson. See An interactive review of Free by Chris Anderson, John has missed the essential point of Free, Some questions for Chris about “freemium”, Some industries are more Free than others. A review of Free from BusinessWeek, Chris Anderson: Not Just Info Wants to Be Free. Overall, interesting discussions as the book goes live. These discussions are healthy and very interesting to follow. Chris has good points and he is describing something that it is already happening. From my side, I am waiting the book I have pre-ordered from Amazon, even though I have been reading Chris’s blog for quite a while and I have followed these topics for a few years already.